A 1969 graduate of Tucson High, Delano started in basketball for three years, and captained the 1969 team that won the 5A state championship and was an all-city selection, averaging 21.5 points per game. The team set a state single-game scoring record of 128 points, a mark that still stands. 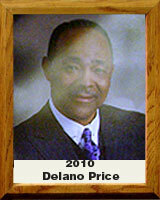 Price started for two years at Phoenix Community College and was all-conference in 1971. He was the team’s leading scorer (20.0). From 1978 to 1982, Price coached basketball at the middle school (Apollo) and freshman (Sunnyside) level. In 1982, he became the first African-American to be appointed head boy’s basketball coach in Tucson when he was hired by Sunnyside. His 1983 team reached the Southern Region semi-finals. He became assistant principal at Sabino High and worked with baseball coach Mike Bejarno to install dugouts, one of the first high schools in the city to do so. In 1990, he became the first African-American administrator (assistant principal) at Sunnyside High, with responsibilities of activities/athletics, operations, and discipline. In 2001, he was an honorary lifetime pass recipient from the Arizona Interscholastic Association in recognition of exemplary service to the interscholastic programs for the youth of Arizona. In 2007, he was inducted into the Tucson High Badger “T” Club Hall of Fame.